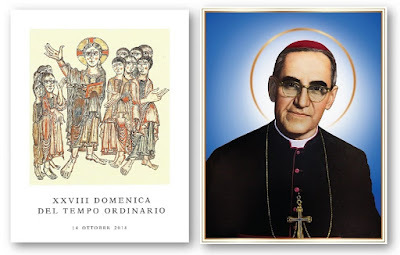 Blessed OSCAR ARNULFO ROMERO GALDAMEZ was born in Ciudad Barrios in the Republic of El Salvador on August 15, 1917. He was ordained a priest in 1942. He was a parish priest in the Diocese of San Miguel for twenty years. In 1970 he was appointed auxiliary in San Salvador, then Bishop of Santiago de Maria and in 1977 Archbishop of San Salvador. In the meantime a serious political crisis broke out in the country that resulted in a civil war. Archbishop Romero felt the pastoral duty to assume an attitude of fortitude upon seeing violence against the weak, and the killing of priests and catechists. On March 24, 1980, he was assassinated while celebrating Mass. In 2015, Your Holiness declared him Blessed. OSCAR ARNULFO ROMERO GALDAMEZ was born in Ciudad Barrios (El Salvador) on August 15, 1917, in a modest family. At 12 he worked in a carpentry shop. In 1930 he entered the minor seminary of San Miguel. In 1943 he obtained a degree in theology, at the Gregorian University. Ordained a priest, he returned to his homeland and as a parish priest he dedicated himself passionately to pastoral activity. Later, he was appointed director of the Seminary of San Salvador, secretary of the Episcopal Conference of El Salvador and executive secretary of CEDAC. In 1970 he was elected Auxiliary Bishop of San Salvador and dedicated himself to the defense of the poor. In 1974 he was appointed Bishop of Santiago de María and in 1977 Archbishop of San Salvador, in full social and political repression. On March 24, 1980, while celebrating Mass with the sick at the hospital, he was murdered. He was beatified in 2015 in San Salvador.